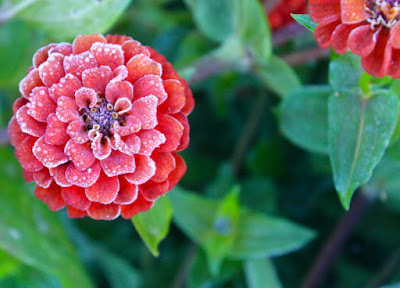 The first frost of autumn took me totally by surprise at the beginning of this week. I usually listen avidly to the weather forecast, but somehow I missed the warning. When I looked out the den window as the sun was rising, I didn't notice the telltale coating of white on the grass. It wasn't until I checked the thermometer that I realized what had happened. Grabbing a warm coat, I went outside to survey the damage. At first I didn't see Jack Frost had left his silvery signature on the grass. 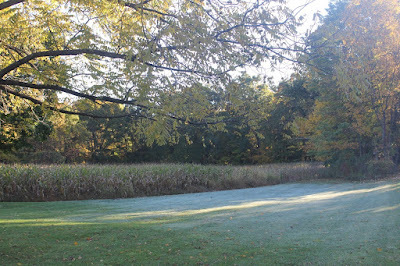 The frost was evident at the edge of the lower cornfield. 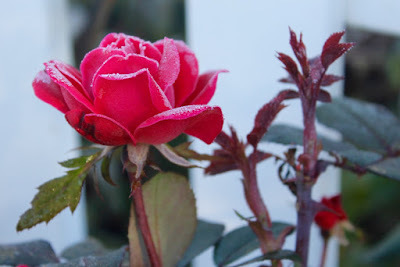 The roses looked so pretty sugar-sprinkled with frost. 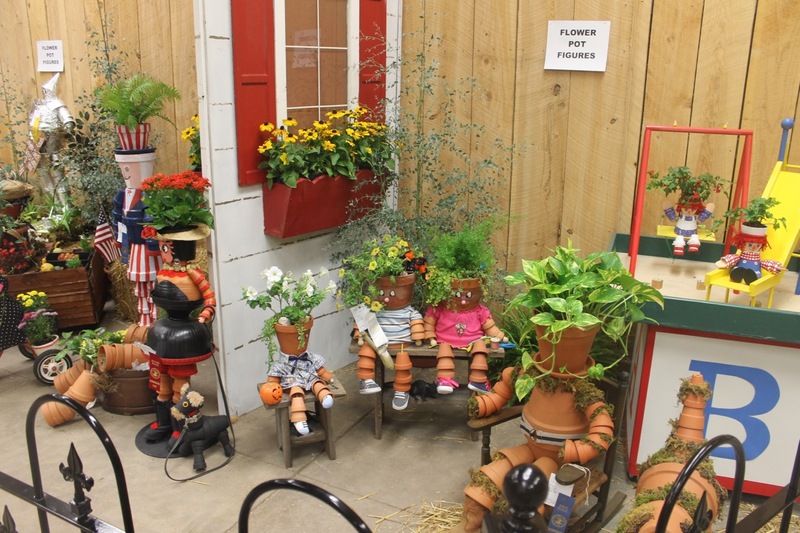 Some plants seemed completely unaffected. The shrubs around yarrow 'The Pearl' may have provided protection. 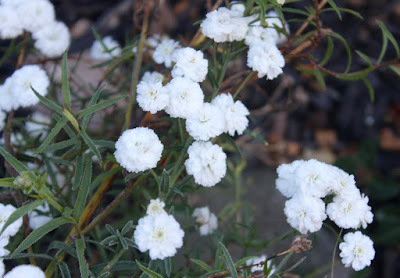 It's tiny white flowers continue to bloom unblemished a week later. The real tragedy awaited me in the kitchen garden. 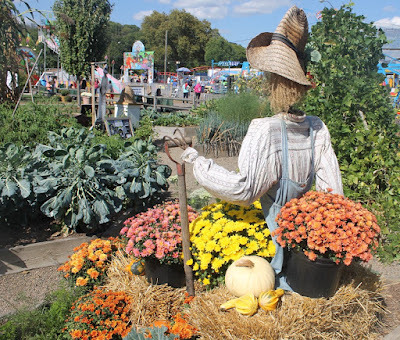 Most vegetables and annuals were zapped. 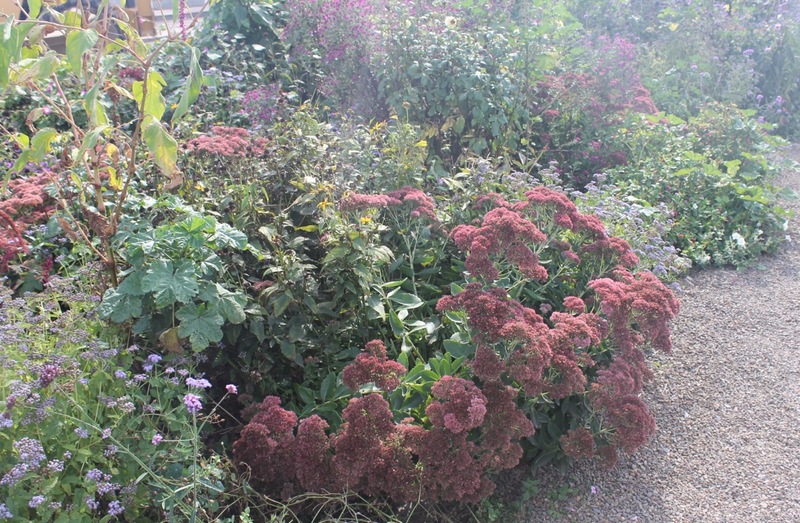 I say 'tragedy' because I usually gather as many of the annuals as possible and fill vases in the house the day before an expected frost. 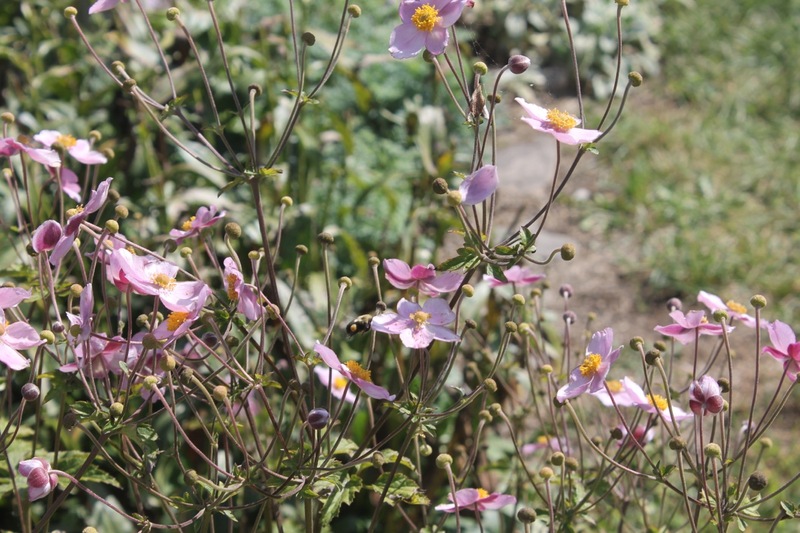 I didn't anticipate this one, so couldn't enjoy the beauty of the blooms for a little longer. I gathered tomatoes, both ripe and green, and hope I saved them. Wrapping the green tomatoes in newspaper will ensure they ripen. 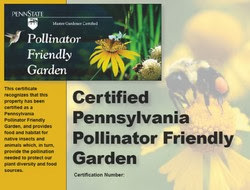 We'll be eating them for months to come. 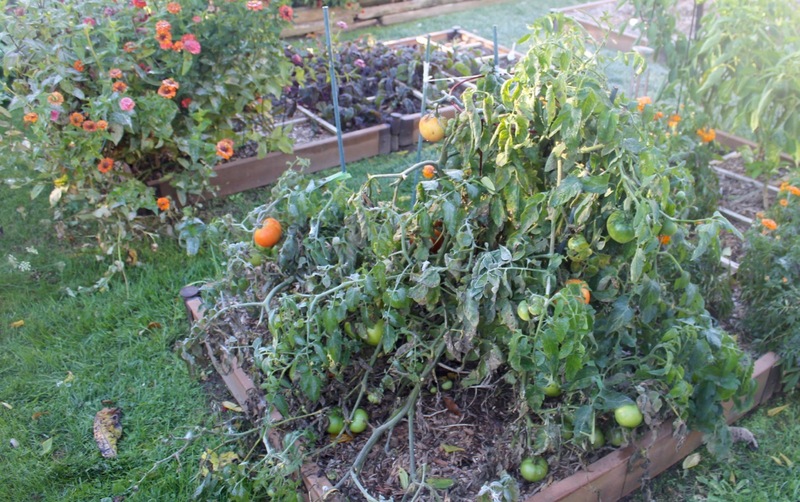 Tomato, zinnia and marigold plants hit by frost. Zinnia elegans Zinnia 'Cut and Come Again' mix. On the patio the leaves of the cannas displayed white frosting. 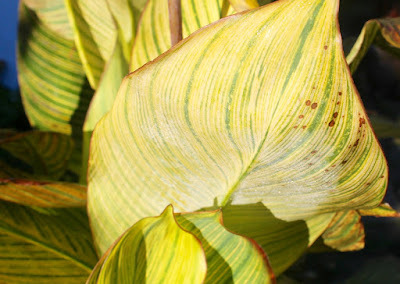 This will be my first attempt to overwinter cannas and my research tells me to allow a couple of frosts before cutting them back and bringing the tubers indoors. A second frost last night means that today I will take the necessary steps to ensure the survival of these tropical beauties. 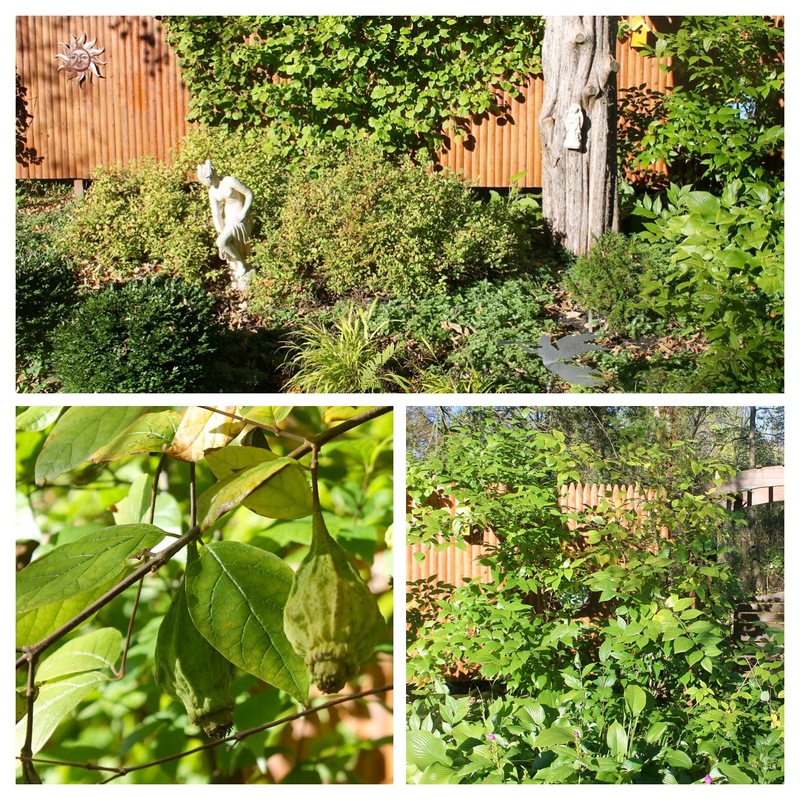 At the beginning of the week there was insignificant color change in my garden. 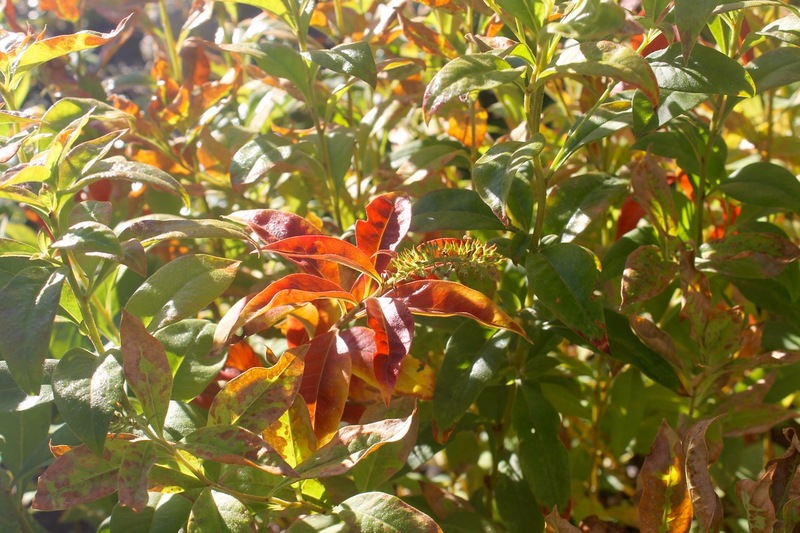 Some plants like vibirnum and gooseneck loosestrife obliged me with a little fall hue, but the leaves of most trees and flowers were extremely late acknowledging the new season. After the first frost, the leaves on the trees between the lower field and the top field gradually began to change. 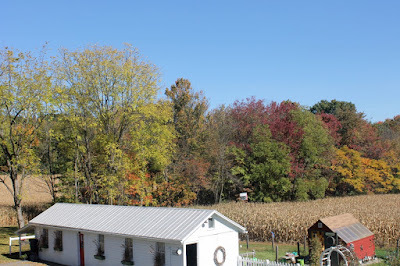 This is a less vibrant PA fall than other years and many leaves fell before changing color. 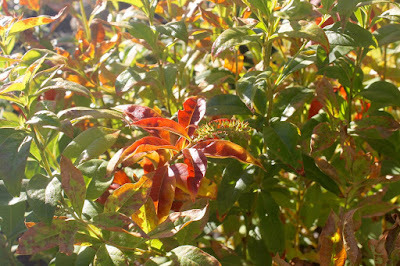 Autumn colors at last. 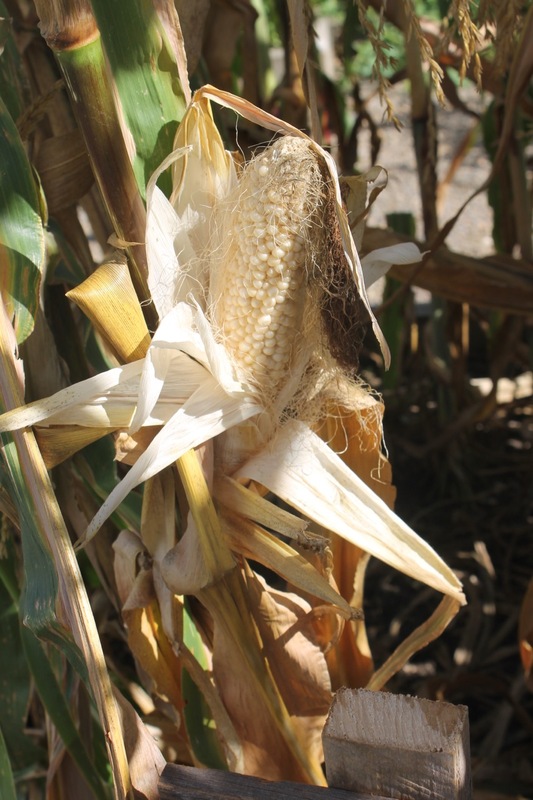 Corn ready to harvest. On this Garden Bloggers' Bloom Day some of my perennials continue to bloom: Agastache foeniculum Anise hyssop; Geranium Cranesbill gerannium 'Rozanne; Perovskia atriplicifolia Russian sage; miniature rose (forgotten which one); Phlox paniculata Phlox 'Bright Eyes' to name some of them. 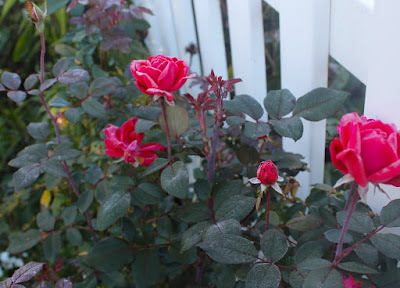 You will see many more flowers blooming around the world when you visit our host, Carol, at her blog, May Dream's Gardens. 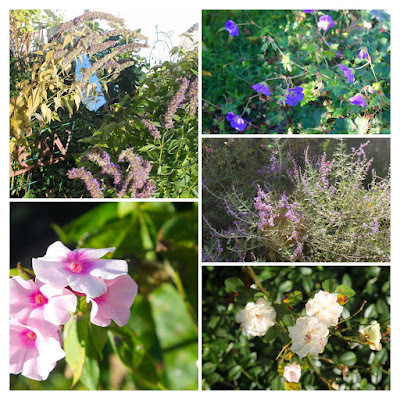 Clockwise from top left: Hyssop, perennial geranium, Russion sage, miniature rose, phlox. I had difficulty choosing a plant that I 'couldn't live without' for Diana's Dozen this month -- I love so many. 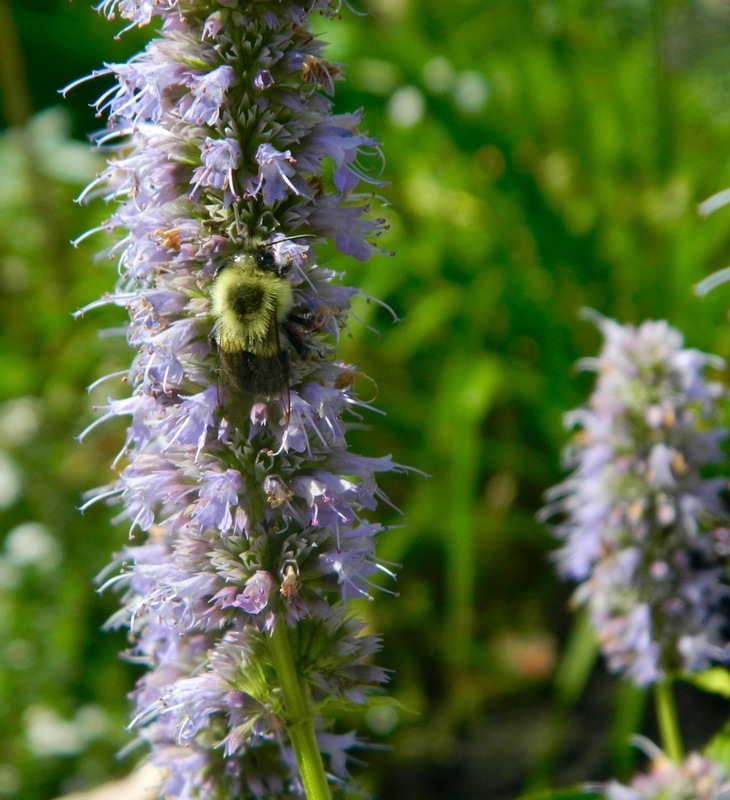 I decided on anise hyssop, not least for its wonderful licorice smell. Anise hyssop is a native herb with edible, fuzzy spikes loved by bees, hummingbirds and butterflies. I like to crumble the flowers into salads. 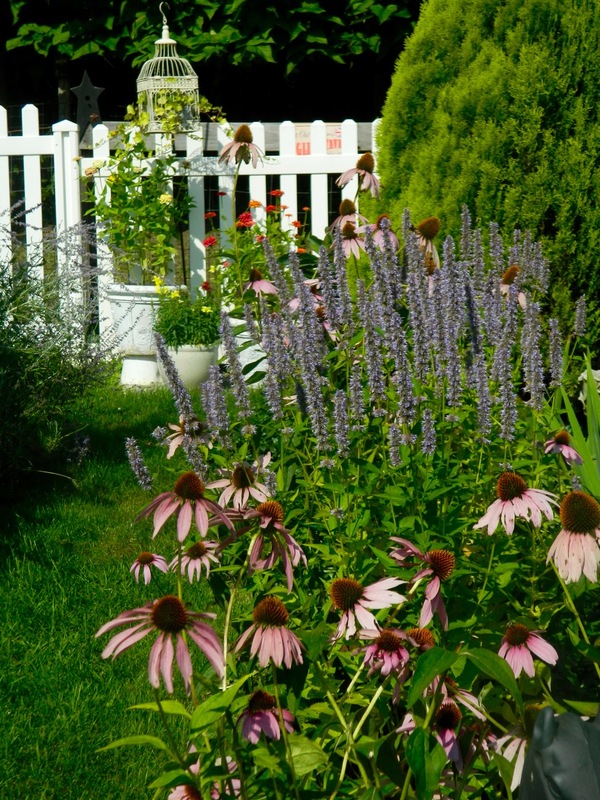 I don't cut anise hyssop down in the fall but leave it standing for winter interest. 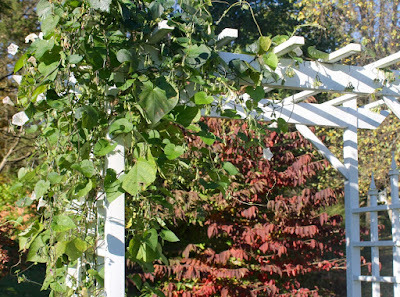 The archway through to the shade garden frames the red foliage of the viburnum. 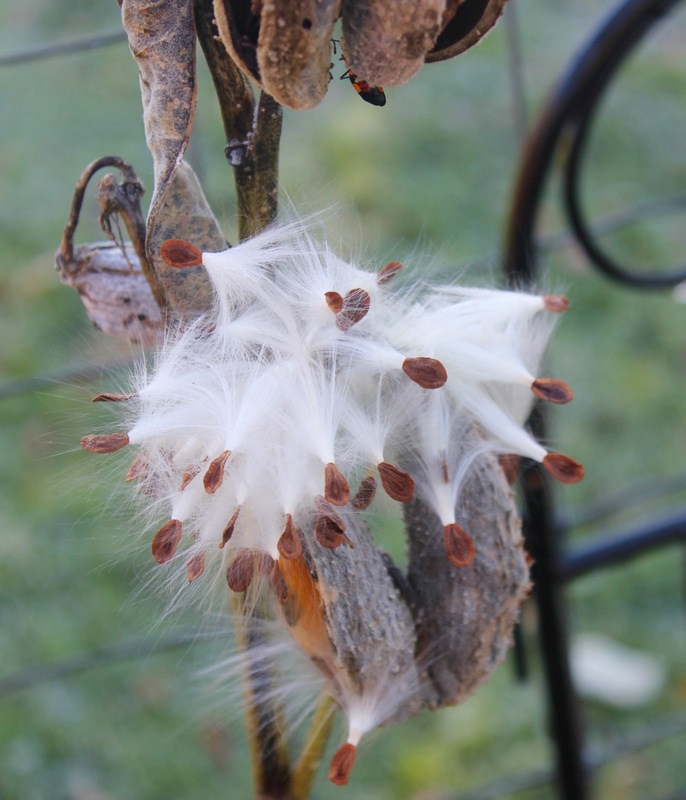 The white morning glories continued to bloom after the first frost; the second frost finished them off. 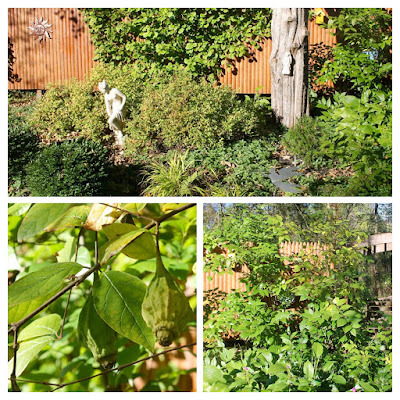 In the serenity garden Calycanthus floridus Sweetshrub, or Carolina allspice, bears its unusual seedpods. 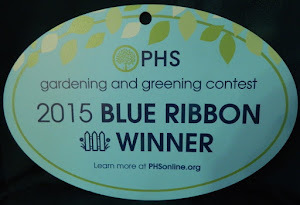 I haven't done much toward putting the garden to bed yet. 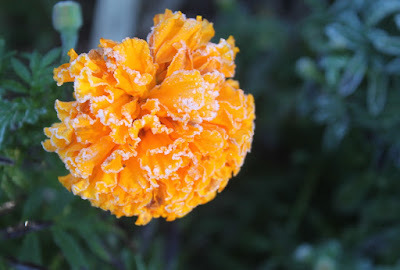 It's been a bit cold for me and I'm waiting for the temperature to rise a little. The forecast says warmer next week, so I'm going out now just to take care of the cannas and leaving the rest of the work for a few more days. Wishing you all a happy Garden Bloggers' Bloom Day. 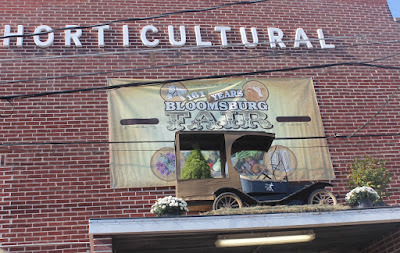 We drove to Bloomsburg, Pennsylvania for the 161st annual fair. 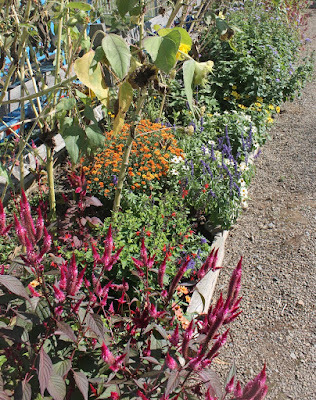 It is so much bigger than our small (but quintessential) West End Fair where I enter my flowers and vegetables. I love country fairs for their horticultural exhibits, the animals, the shows, the food -- but not one of these is my favorite at Bloomsburg. 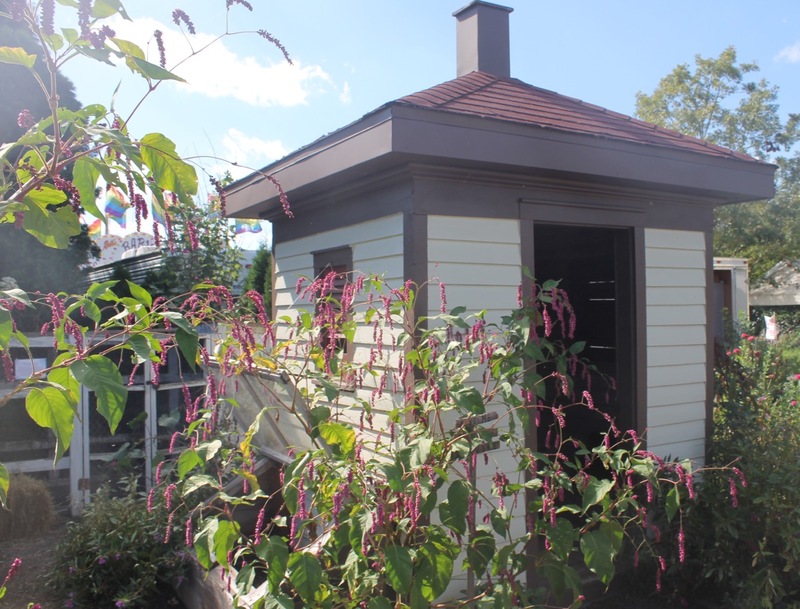 For me the historical area at Bloomsburg Fair distinguishes it from all others with the Caleb Barton House and restored gardens. 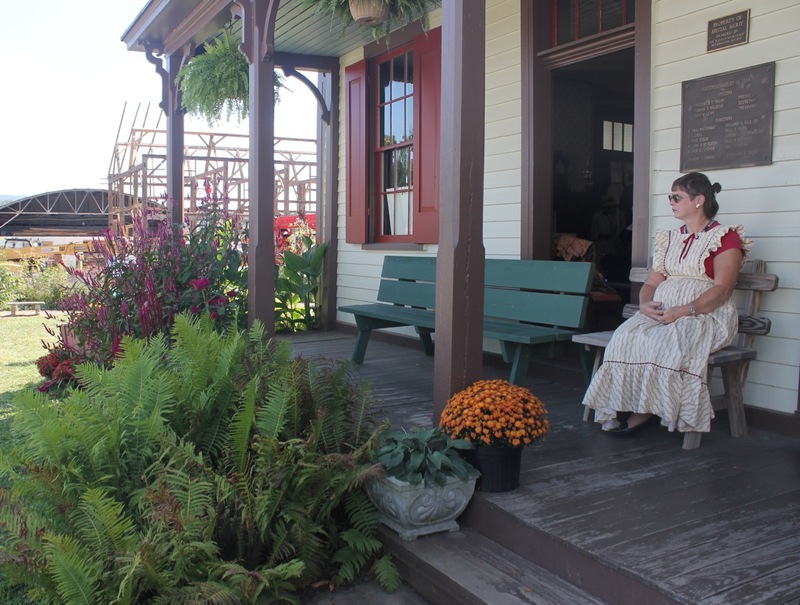 Caleb Barton built the residence in 1855 and local citizens held the first fair in Barton's field the same year. 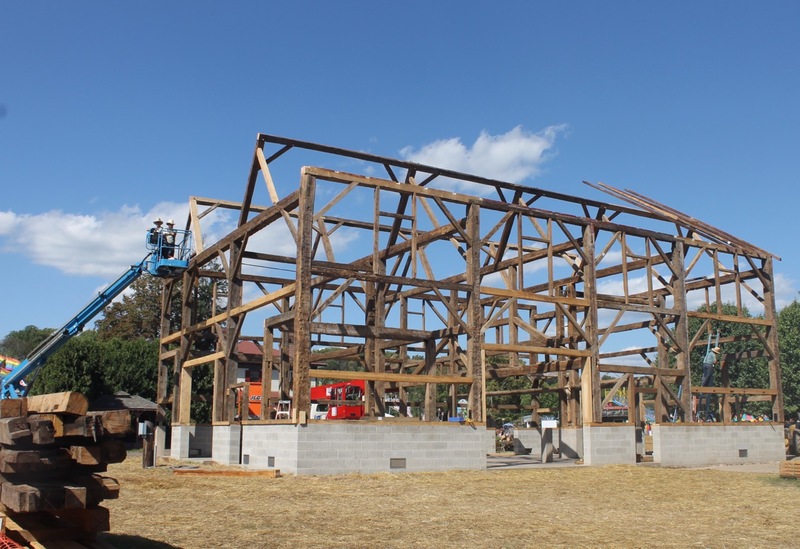 New this year to the historic site was a traditional barn raising by the Amish community. They used vintage timber from barns previously demolished. We were interested to see that these Amish men used power tools. While they, 'The Plain People', live and work as did their forefathers, still traveling in horse drawn buggies, it seems that modern life has caught up with them a little. 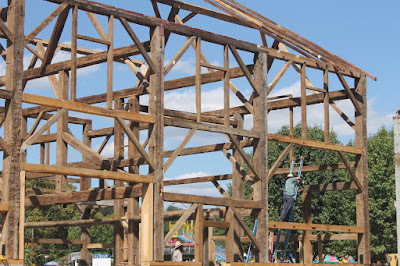 We later saw on TV that the barn was largely finished by the end of the fair. Being anxious to tour the garden, I hurried there next. 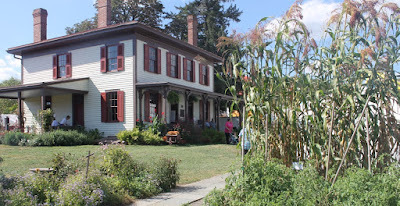 If you look at the picture of the house at the top of the page you will see a tall stand of corn on the right.This is 'Country Gentlemen' sweetcorn with its distinctive white kernels arranged in a zigzag pattern, not in rows. 'Country Gentlemen' is an heirloom variety. 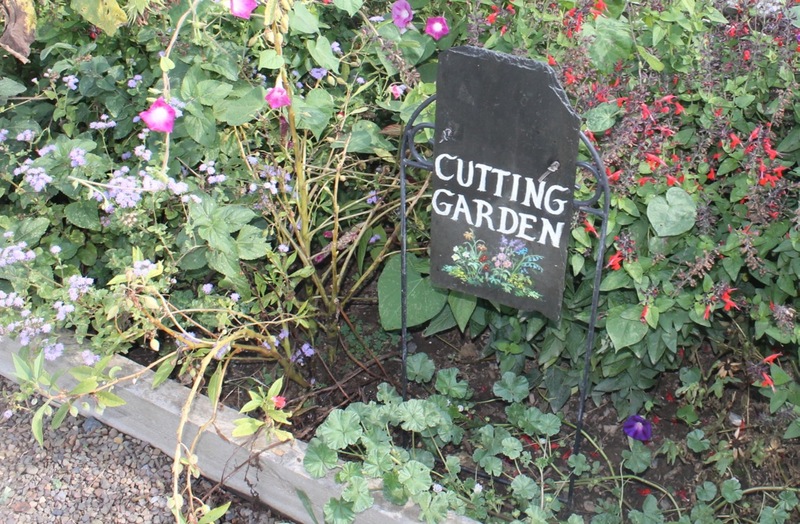 Most of the plants in this garden are from heirloom seeds, sown and beautifully maintained by a local herb society. 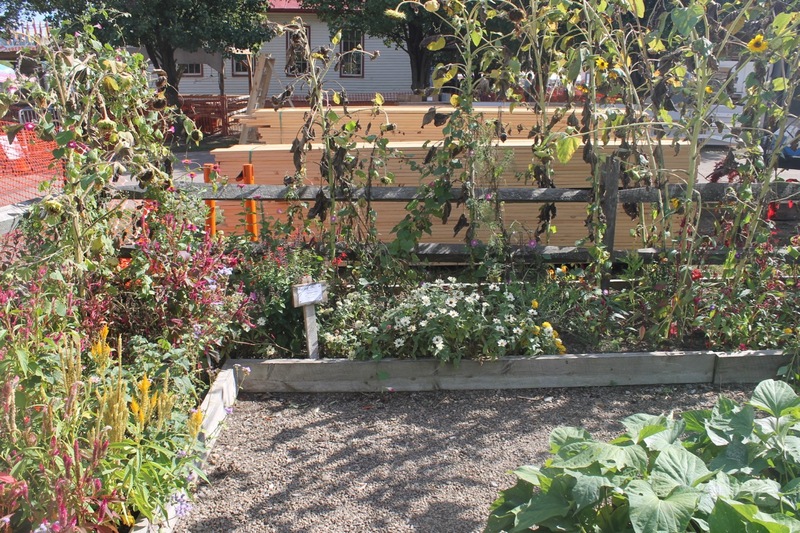 Raised beds predominate the garden. 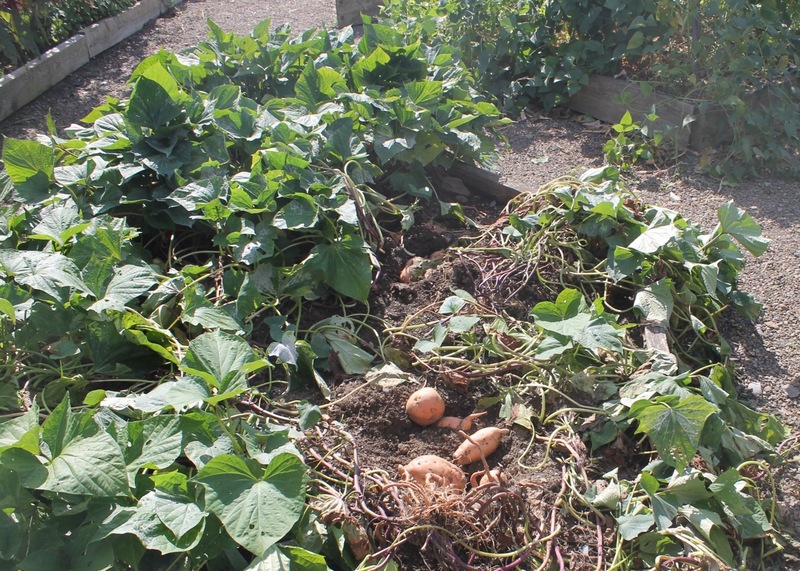 They contain a variety of vegetables including tomatoes, cabbages, potatoes and sweet potatoes. A cutting garden borders the vegetable area on two sides. Late September blooms made a colorful display. 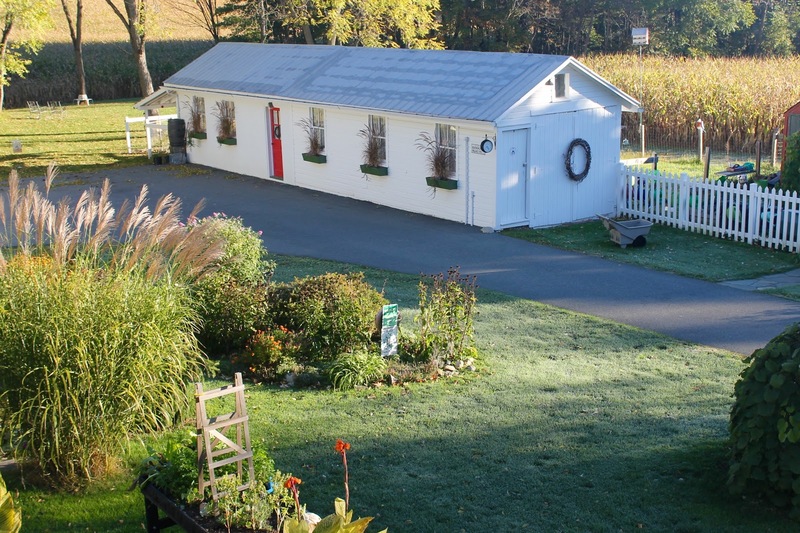 The white structure with the red roof behind the cutting garden (in the next picture) is a restored one-room-schoolhouse -- another building of interest in the historic area of the fair. 'Fading' sunflowers provide vertical interest. 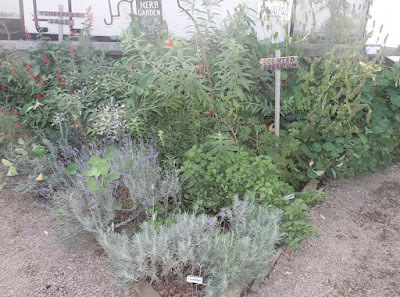 We saw herbs in several beds growing among other plants as well as in the separate herb garden. 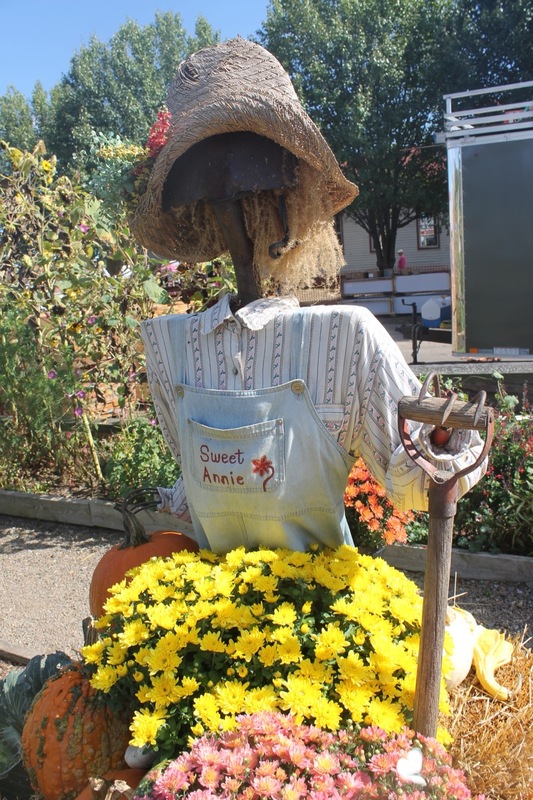 Sweet Annie Scarecrow welcomed fall with her display of mums, gourds and pumpkins. 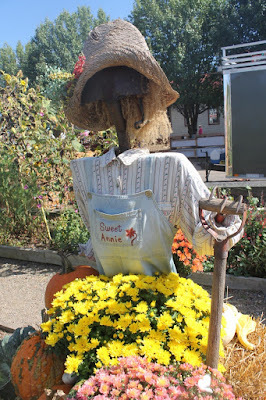 She was constructed of a spade for her face and spine and a three-pronged hand cultivator rake for fingers. With her pretty garden hat she had a stylish autumn look. 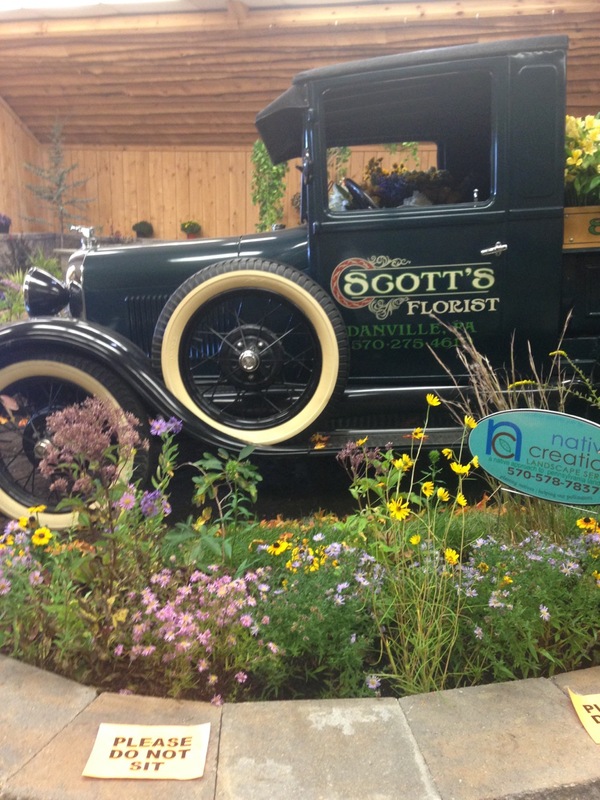 I'd love to copy this idea in my garden. Sweet Annie looking out at all the fun of the fair. The pretty historic outhouse has a cold frame on one side made with an old window casement. 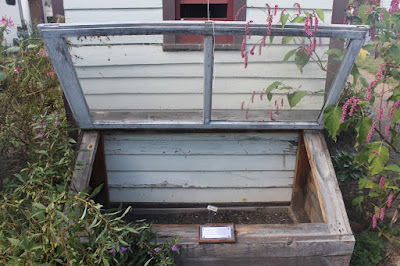 The cold frame contained heirloom spinach 'Amsterdam Prickly Seeded', the type grown by Thomas Jefferson at Monticello. 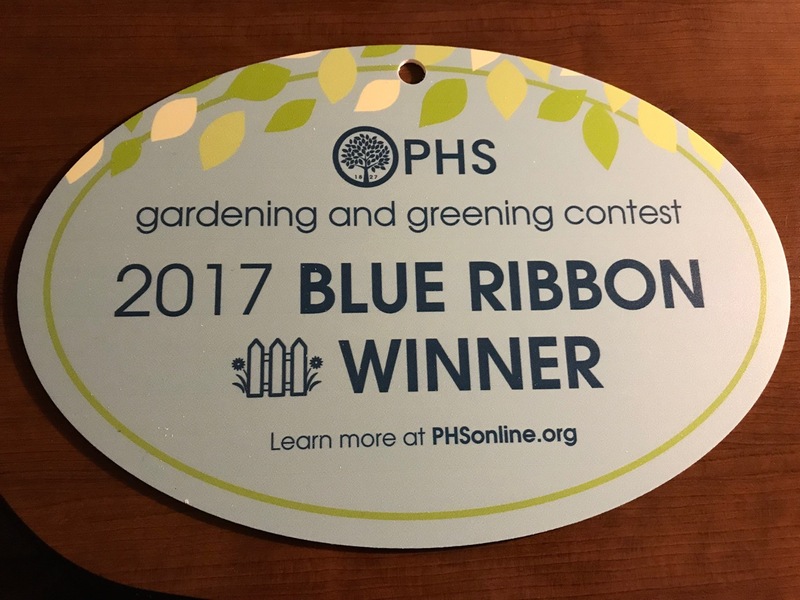 This spinach is said to be very hardy. After the garden, we toured the Caleb Barton House. A costumed guide in each room told us the history with stories about its furniture and other contents. 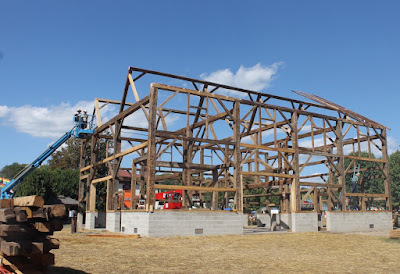 Note the proximity of the barn raising. 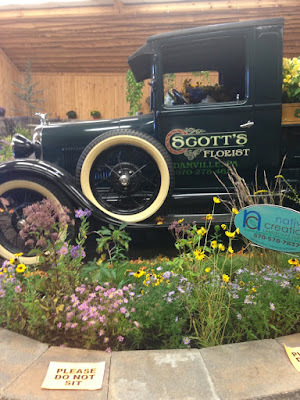 A 1929 Ford floral delivery truck greeted us as we entered the building. 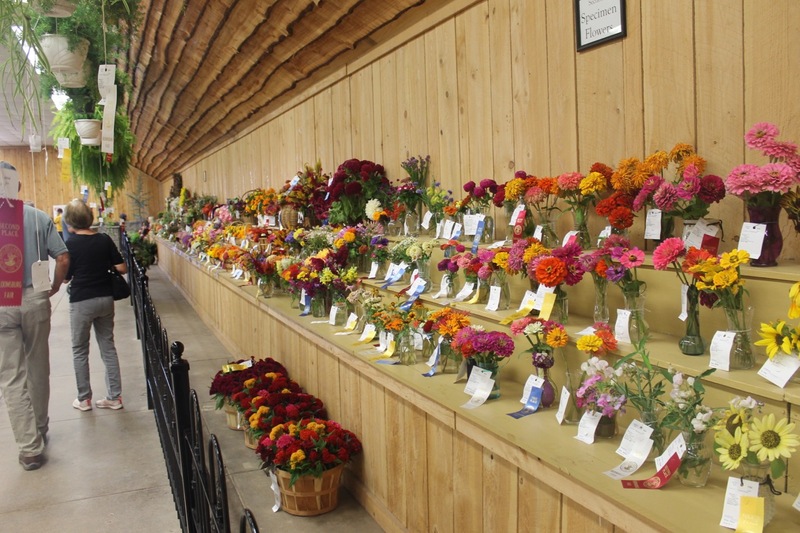 Although the fourth day of the fair, the flower entries were in remarkably good shape. 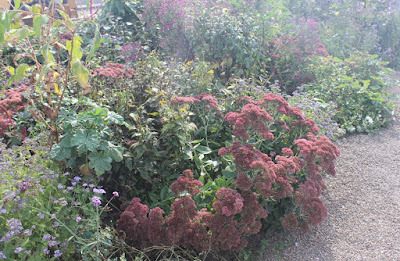 Of course, they were mainly late blooming perennials and annuals. The dahlias were particularly beautiful. 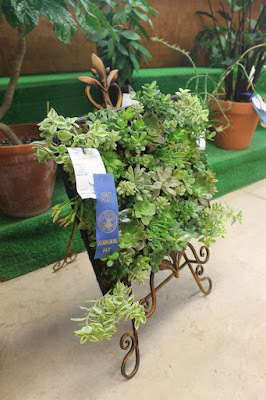 The succulent display, suitable for hanging on a garden wall or fence, was my favorite. Would love this living picture on my shed. 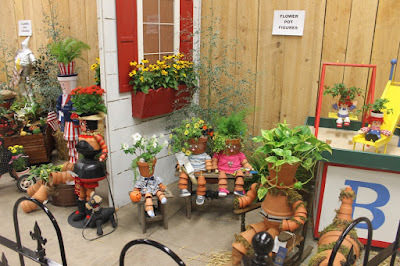 After the exhibit halls we explored the rest of the fair. We bought food from some of the many, many food vendors; so difficult to choose among them. 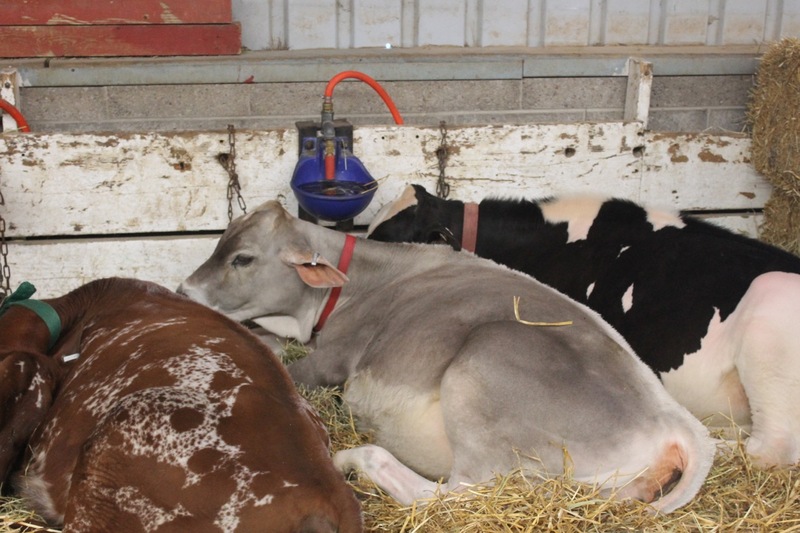 We admired cows, sheep, goats, rabbits, chickens and horses. We watched the Clydesdales strutting their stuff. 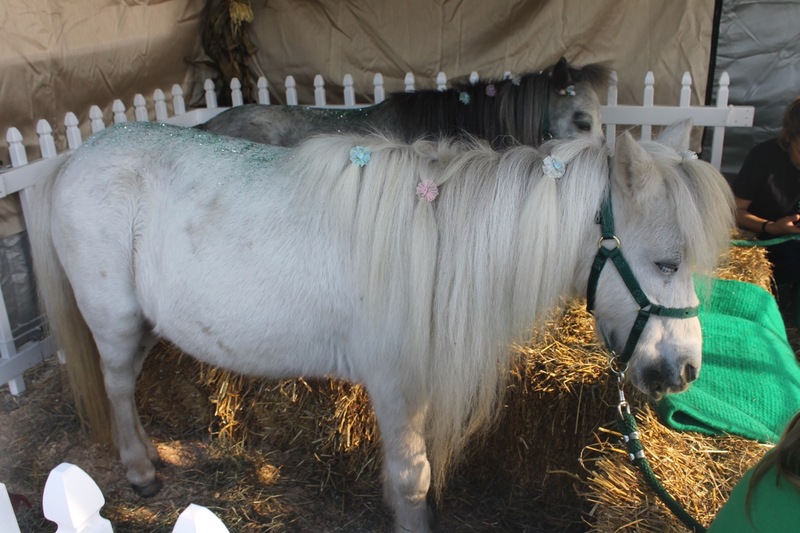 Later, we found the perfect little white buddy for little black Dude, my miniature horse. 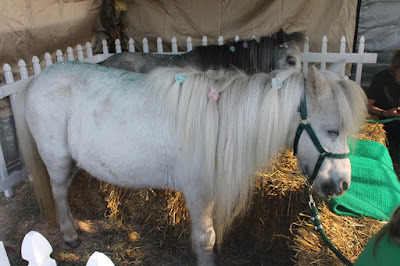 She had pretty barrettes and 'sparkles.' Dude would be enchanted. 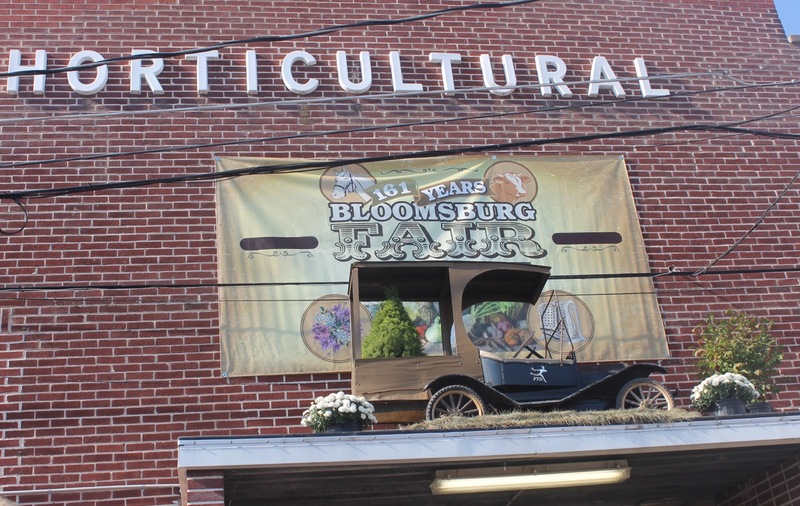 It is said that it always rains at the Bloomsburg Fair and local lore was correct again this year as it poured for the last three or four days. But it didn't rain at the beginning of the week when we were there. 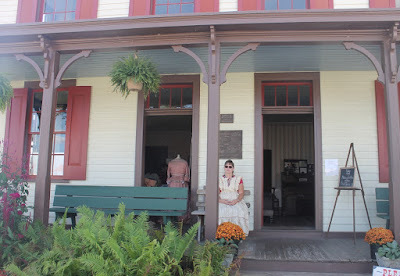 A lovely sunny day filled with sights to remember.